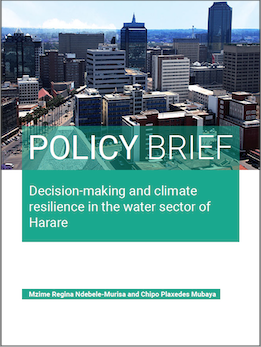 The brief summarizes the context of climate change, variability and water in Harare to contribute to the existing knowledge base on the city’s vulnerability and risks as well as to inform future, sustainable policy, planning and governance of the city in these sectors. The brief suggests a suite of recommendations for the development of the city in the water sector as provision of relevant climate information by the research fraternity; continuous undertaking of risk and vulnerability assessments; setting up of a climate change department/unit within and by the City of Harare which should also ensure optimal resource mobilization for infrastructural development; institutionalization and enforcement of regulations to prevent infrastructural development in areas not serviced with potable water and sewerage while at the same time working on provision of equitable potable water for all citizens. Then both the City of Harare and Government should facilitate an integrated/holistic approach in water resources management in order to avoid overlaps.